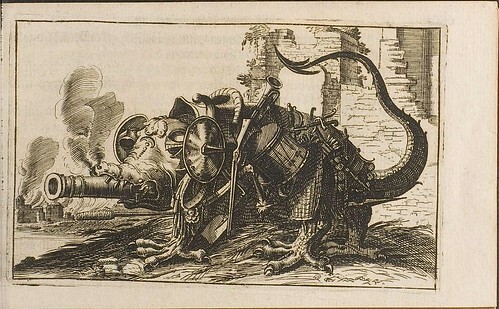 This fabulous dragon 'tank' comes from another volume out of the (very) weird baroque series - 'Frauenzimmer Gesprechspiele' [by GP Harsdoerffer] from HAB - that was featured here a few weeks ago. 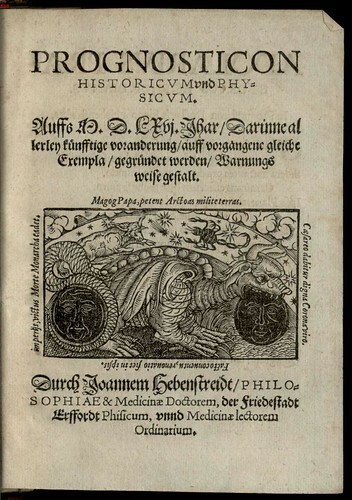 'Prognosticon Historicum und Physicum..' by Johann Hebenstreit, 1565 (at BSB). There are no other illustrations as I recall. This book belongs to the Renaissance symbolist prophecy literature. 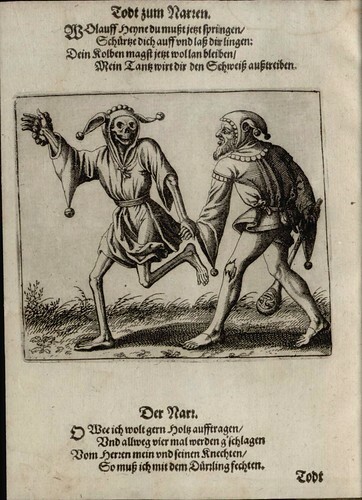 ~1550 by the Lutheran Reformer, Matthias Flacius* [BSB]. 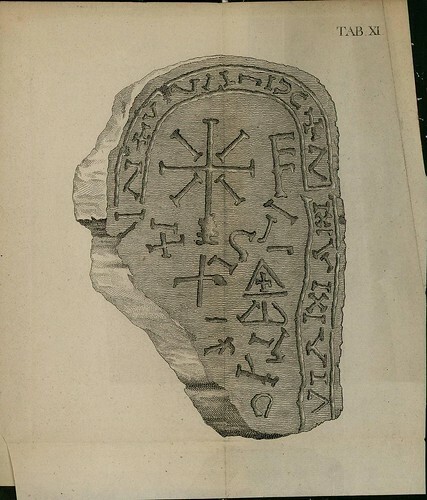 IN: 'Ichthyologie, ou Histoire Naturelle' (the French version of the original German book called: 'Allgemeine Naturgeschichte der Fische') by Marc Éliéser Bloch, 1795. 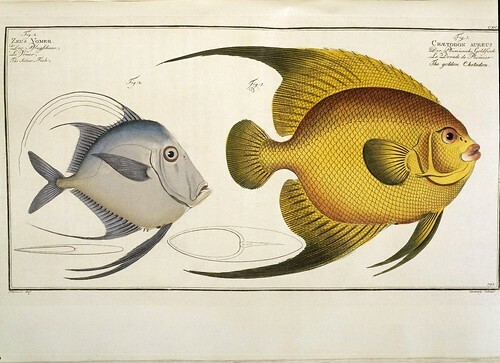 "These series of publications, under the general title 'Allgemeine Naturgeschichte der Fische', Berlin, 1781-95, 12 vols., provided with 432 excellent plate-illustrations, formed the principal work on ichthyology in the eighteenth century. 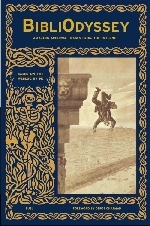 But this great work, which Bloch began to publish at his own expense, would not have been finished were it not for the enthusiasm that the enterprise roused throughout Germany, it being regarded as almost a national affair; so much so indeed that all the princes and patrons of science participated in the publication expenses of the last six volumes, each plate bearing the name of the person at whose cost it had been prepared." 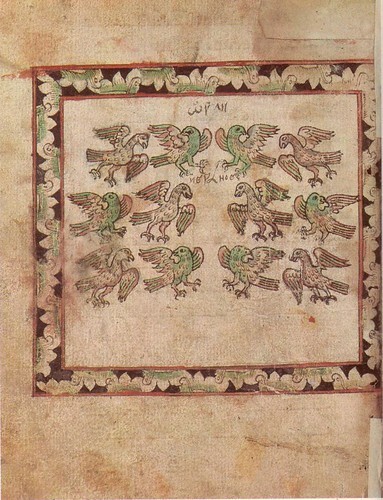 The plate above comes from the Rylands Collection at the University of Manchester. The complete or near complete series is available from the Internet Archive. 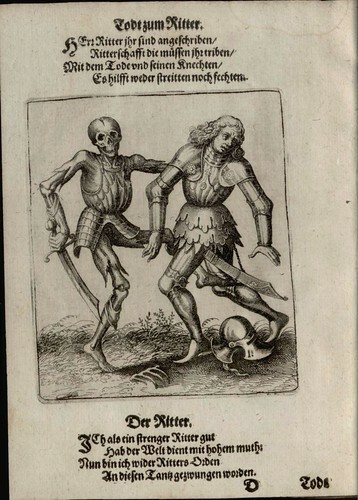 Update: alternatively, the University of Heidelberg have uploaded plates from the original German version of this work (curiously, I can't find the above image): LINK. "Oliver Goldsmith's 'An History of the Earth and Animated Nature'  has been described as everything from "hackwork" to his "most substantial literary legacy"." [source] Heh. I think I would be happy to leave behind a legacy that inspired such a broad reaction. 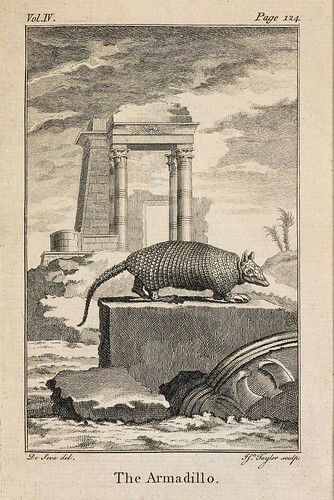 The armadillo plate comes from Rylands. "The Liverpool and Manchester Railway opened September 15, 1830, and was the first to use locomotive power wholly as a form of traction. The 31-mile journey took an hour and a half and cost 5/. 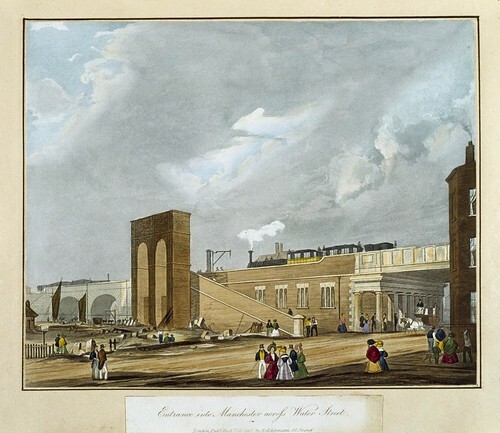 It was a great success and spurred construction of railroads in England and abroad. The locomotive engine was designed by George Stephenson, who won a £500 prize. 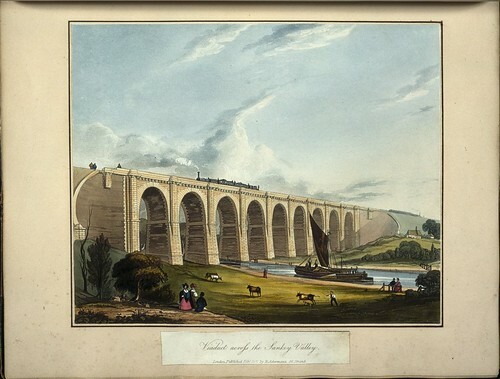 The artist, Thomas Bury, was a noted architect." These unusual and interesting Russian manuscript illustrations come from a rare 17th century work held in the State Historical Museum* in Moscow. Scans of the manuscript were posted on the babs71 Livejournal page. 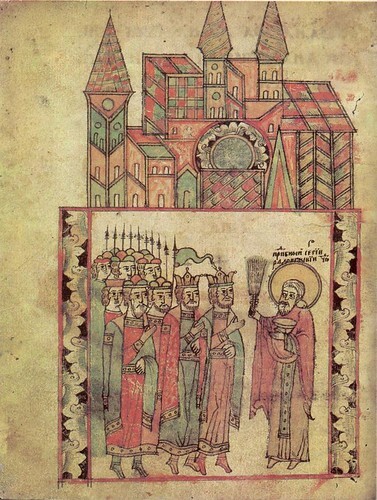 "The Skazanie is a romance, composed in the 15th century, relating the struggle of the Muscovian Grand Prince, Dmitri Donskoj, against his Tartar opponent, Mamai. 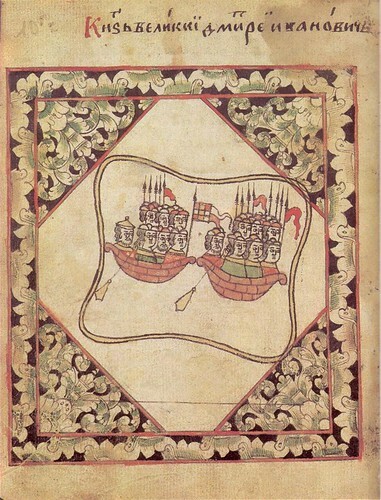 The central focus is the battle of Kulikovo (1380) at which Mamai was routed. 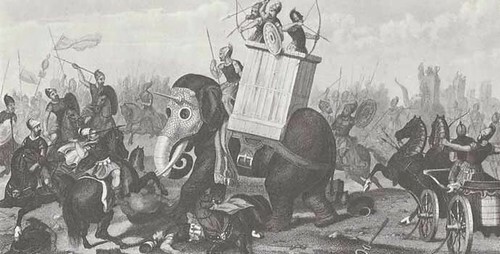 The victory is presented in the context of a crusade and is couched in terms reminiscent of the contest between Gideon and the Midianites (Judges 7)." subscription ticket by William Hogarth, 1830. 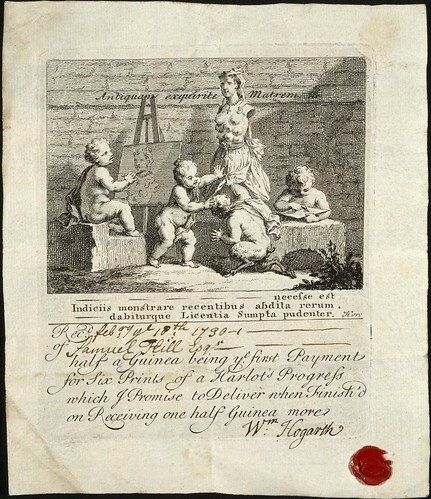 Notes from Rylands: "Subscription ticket, signed & sealed by Hogarth, issued to Samuel Hill in receipt of the first payment for 6 prints of 'A Harlot's Progress'. 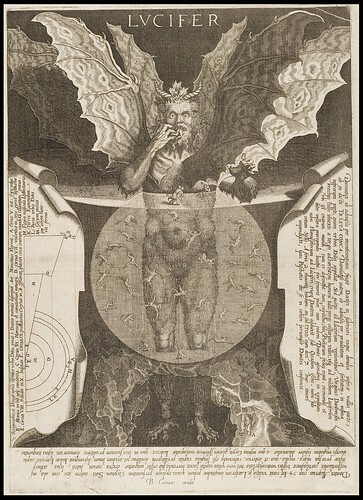 Hogarth features as the satyr lifting Nature's skirts & exposing parts previously ignored by art." This exquisite celtic knotwork illuminated letter 'b' from the late 10th century, comes from a latin vellum manuscript known as 'Evangelia Ottonis'. 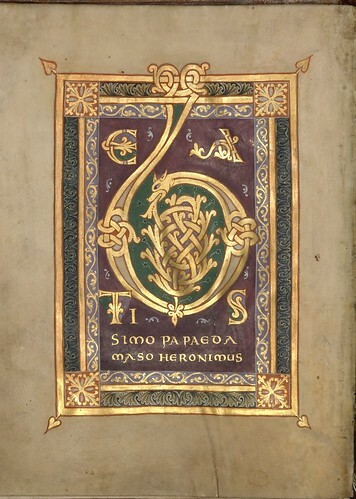 The notes at Rylands mention that it is possibly Italian in origin. 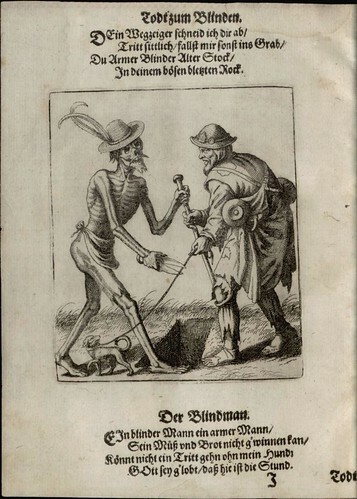 Murals of the dance of death (danse macabre or totentanz) scenes were painted on walls in a church and a convent in Basel in the early to mid-1400s. 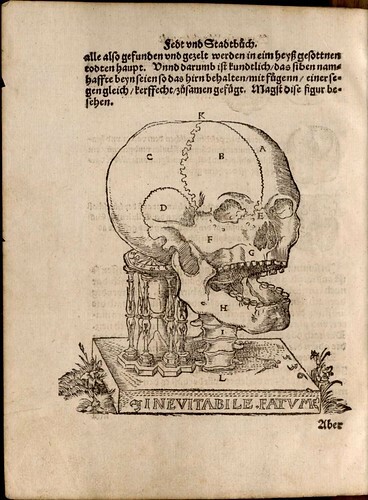 They are important examples of the tradition since they are the link back to its medieval origins and also because they served as the inspiration for the classic iconography produced by Hans Holbein the Younger in his 'Imagines Mortis', first published in 1527. 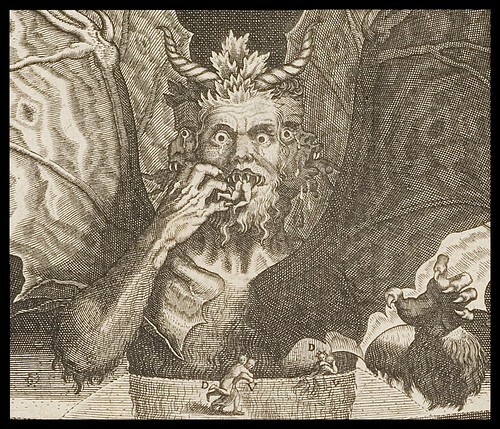 The murals were eventually destroyed and the most faithful reproductions of the figures in those scenes were said to have been engraved by native Basel artist, Matthäus Merian, for his 1621 book 'Todtentanz, Wie Derselbe..'. 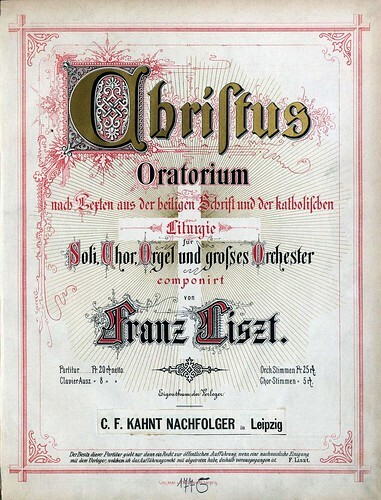 As far as I know, the first full version of this work was made available online recently by the Bavarian State Library. Raising Rebels: An Exhibition of Radical Children's Literature at Syracuse University Library. Although this will primarily be of interest to Czech readers, there is a collection of early 20th century periodicals available from the Institute of Czech Literature. They (apparently) cover a range of topics such as humour, theatre, art and design, with something of an avant-garde edge. There are illustrations/cartoons in there. I say apparently because, although it's fairly straight forward navigation, I haven't spent much time looking as yet. Full page images are available in greyscale. Building floorplans from 17th/18th century Baroque-Gothic Czech architect, Jan Blazej Santini-Aichel. I don't remember where this link came from. [Thanks Karla!] There is a fair bit of english around on the site. Old Book Art has scans of some unique books available. Many, many more links in the bookmarks. I always find the annotated BibliOdyssey delicious page is the easiest way to find things. Lately I've been saving shared feeds here. 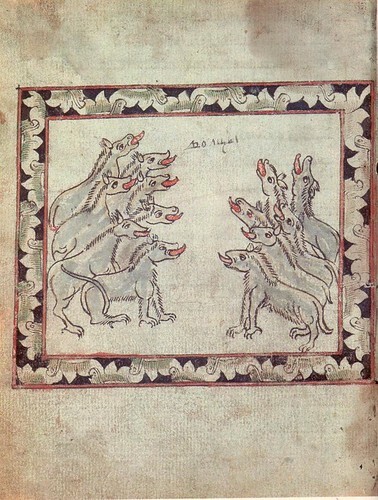 Does someone know what the script in the image tagged "wolves" is/says? I think I sent you the two Czech links (what a surprise...), but the digitized periodicals page seems to have changed somewhat since I last looked. Suddenly I only seem to be able to get Zlatá Praha out of it... (then again maybe I'm doing something wrong as I HAVE A HEADACHE and can't think straight). For the non-Czech-readers, anything with "divadlo" or "divadel" in it relates to theater, Humoristické listy is worth a look, Světozor and Šibeničky have lots of pictures, Rozpravy Aventina was a cultural periodical and has lots of photos and cartoons scattered through. Some of the others are primarily text. 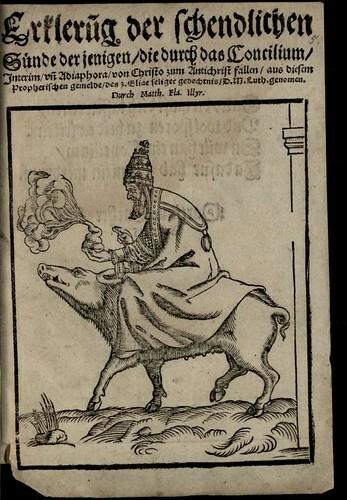 The 1643 Popemobile from LOL Manuscripts! is another good example for your quasi-biological tank set. Heh. Thanks Ray, good call. Yes, your comment was deleted. This is because you decided to add a link to your site in the comment when your site has no relationship to this post. I doubt that wearing night vision goggles and gobbling down a fistful of acid would help to establish any vague connection between your seven-odd token words, your link and the array of material in this post, but hey, maybe that's just me. But don't be dissuaded from commenting: perhaps if you tried making some sort of actual contribution, adding some morsel of humour or some cogent observation, then the people who read down this far in the post would feel so moved by the light of your intellect that they would feel compelled to click on your user profile and follow you back to your homepage. So unless a self-link is on-topic or contributes something of worth, it will be deleted. This goes for anyone who wants to self-link to show that they are citing BibliOdyssey (unless it contributes something on-topic of value). There are a whole bunch of blog search engines out there through which I can find linkbacks. There is no need to make an announcement. Because the next step is to turn comments off altogether. I love, love, LOVE this blog - every post makes me swoon. thanks!